The Wong Kar Wai produced, Zhang Jiajia directed film SEE YOU TOMORROW (BAI DOH YUN) yesterday held its premiere press conference in Beijing. 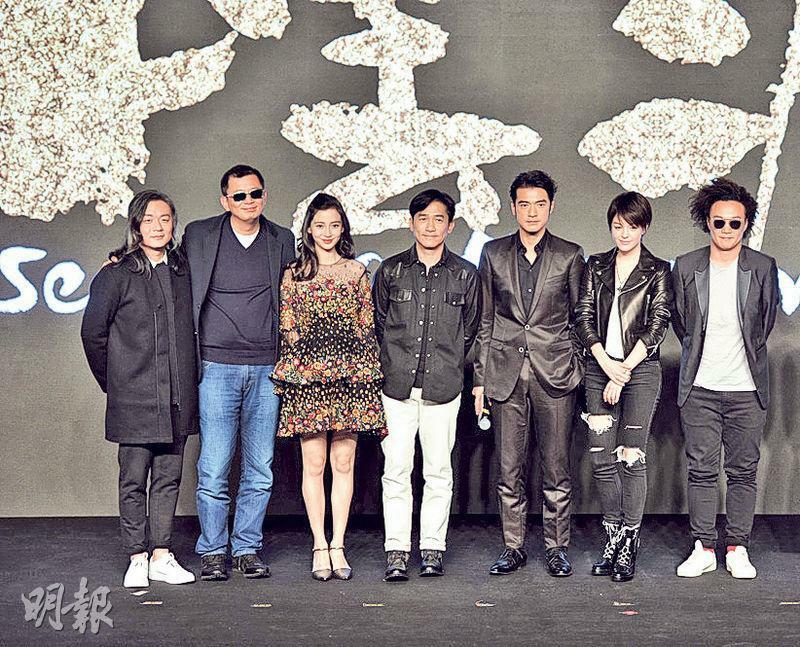 Wong Kar Wai, Zhang Jiajia led Tony Leung Chiu Wai, Takeshi Kaneshiro (Gum Sing Mo), Eason Chan Yik Shun, Angelababy, Sandrine Pinna (Cheung Yung Yung), Jennifer Du Juan, Lynn Xiong (Hung Doi Lam), Da Peng, Ma Su, Cui Zhijia and Jia Ling in an appearance together. Wai Jai, Gum Sing Mo and Baby in the film turned their god and goddess images upside down. Wai Jai was even stumped by the dialogues this time. Wong Kar Wai revealed that Wai Jai could not say the line "love is acting foolish." Yesterday producer Wong Kar Wai, director Zhang Jiajia talked about the stories about the SEE YOU TOMORROW shoot. Zhang Jiajia recalled the first time she met Director Wong Kar Wai. "Director Wong Kar Wai asked me, what movie do you like? I said ASHES OF TIME and CHINESE ODYSSEY. Director Wong said, "Then do you want to make ASHES OF TIME or CHINESE ODYSSEY?' I said, "Can I use Chow Sing Chi's method to tell a Wong Kar Wai story?' Director Wong was quiet for awhile and said, 'Let me help you'." Zhang Jiajia even admitted that when he started making movies he did not believe in himself. He told his idol Wong Kar Wai, "When I make the movie, would you please be on the set from the beginning to the end" He never expected Wong Kar Wai to truly spend three years on the set, from the beginning to the end teaching him how to make a movie by hand. Thus, after 10 months of "madness", a very "Chow Sing Chi" but also very "Wong Kar Wai" movie arrived. This year happened to be Jet Tone's 25th anniversary. When Jet Tone released its first film, it was the Wong Kar Wai produced, Leung Chiu Wai, Brigitte Lin (Lam Ching Ha), Leslie Cheung Kwok Wing, Jacky Cheung Hok Yau, Tony Leung Ka Fai starred classic comedy EAGLE SHOOTING HEROES (DUNG SING SAI JAU). Now after 25 years, Wong Kar Wai produced another star studded comedy SEE YOU TOMORROW that will soon open. The meaning was extraordinary. Leung Chiu Wai, Gum Sing Mok, Angelababy appeared together. This was also the first public appearance for Baby since she announced her pregnancy. Three stills from film greatly discounted their god and goddess image. Wai Jai admitted that this time he not only turned his image upside down but also ran into language difficulty. In the film he not only had a lot of lines but also all Putonghua lines. Everyday as the director changed the script he practiced his lines anew. The challenge was enormous. Wong Kar Wai even revealed that Wai Jai could not deliver the line "love is acting foolish" in the film. Wai Jai was asked to say this line, but he declined. "Better not". Gum Sing Mo said that the production was very pleasant. "The director keep saying, I have to have the looks of a 18 year old. I did it several times but it was still wrong. However when I found that direction, the shoot was very pleasant." Baby in the film had a face full of clothes pins. She thought that the Ferryman had to be more vicious to herself, she had to feel what others feel. Speaking of working with Wong Kar Wai and Zhang Jiajia she said, "Each time when I couldn't go on, I would tell myself, I have to be more vicious to myself, I can't disappoint the director for giving me a chance. I really risked my life over these ten months." Wong Kar Wai was very pleased with Baby's performance this time. 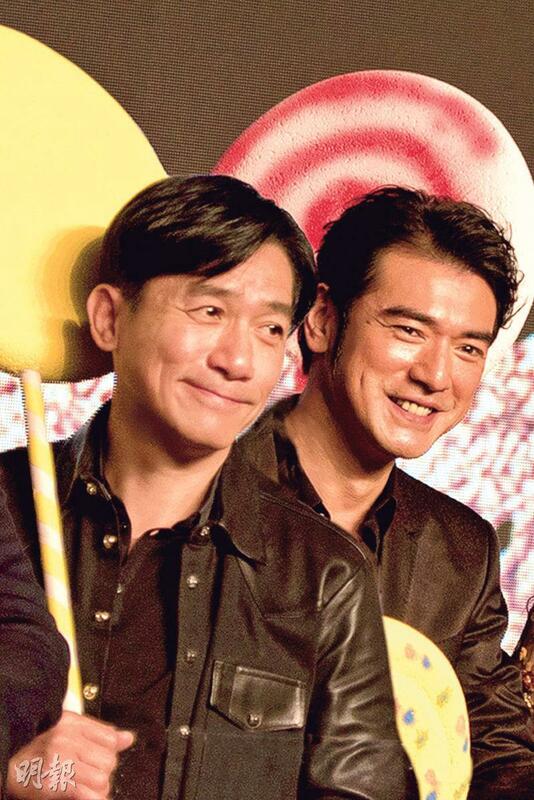 "Among actors I have worked with, I feel the most hard working is (Andy) Lau Tak Wa. However when I ran into Angelababy I realized that she was even more hard working than he was. I believed that after watching SEE YOU TOMORROW, everyone would feel that Angelababy was no longer an idol but an actress." Chan Yik Shun worked with Wong Kar wai for the first time and played a disillusioned singer. Wong Kar Wai praised Eason for being very focused in his acting, which surpassed his expectation. In addition, Ma Su, Hung Doi Lam, Cui Zhijia shared memories from the shoot. Ma Su in the trailer gave Leung Chiu Wai a beating. She said, "At the time I really was super nervous because Leung Chiu Wai was a figure in my film academy textbook." Claiming to be "a man who has kissed Leung Chiu Wai", Cui Zhijia even recalled, "At the time I was afraid that my performance career would be over". The most memorable for Hung Doi Lam was being slapped 41 times in a scene. Even Wong Kar Wai praised, "She would open the eyes of many".